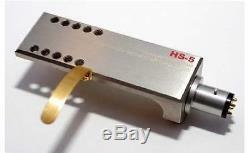 New Yamamoto Sound Craft HS-5 titanium Headshell for DJ's from Japan. Material: Body: Pure titanium Finger-hook part: Brass (nonmagnetic Gold plating finish) - Outside dimension: 18 (W) 50 (L) 16 (H) Length containing a connector part excluding an attachment part and a finger-hook portion: 62mm -Weight : 18.4g (attachment screw containing a lead is not included) - Accessories: Product made from brass Gold plating attachment screw Three-sort attachment. Choose American Bank or Japanese. Japan Post EMS or YAMATO DHL. Back guarantee for defective products. We never charge you Japanese. These charges are the buyers responsibility. It is based on a company. But it is usually one year. Please feel free to ask questions. We will do our best to answer your question. But please keep in your. Days to answer the question. Which is located in Yokohama. Buyjapan001 = audio products vintage synthesizer musical instruments. International Buyers - Please Note. The item "New Yamamoto Sound Craft HS-5 titanium Headshell for DJ's from Japan" is in sale since Monday, September 18, 2017. This item is in the category "Consumer Electronics\TV, Video & Home Audio\TV, Video & Audio Parts\Record Player, Turntable Parts". The seller is "japanceramicfactory*001" and is located in Yokohama, Kanagawa.